The two women accused of murdering the estranged half-brother of North Korea’s leader toured Kuala Lumpur international airport on Tuesday. as their trial entered its third week. They were escorted by dozens of heavily armed police, and accompanied by the judge, prosecutors, defence lawyers as well as officials from their home countries. 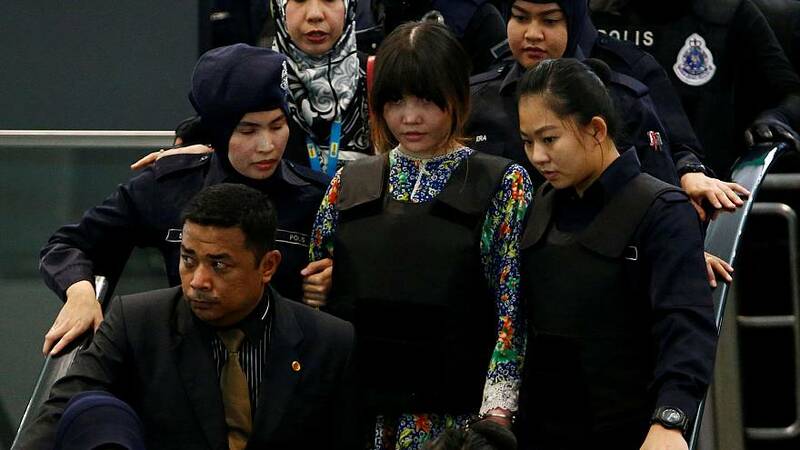 Indonesian Siti Aisyah and Doan Thi Huong of Vietnam are the only two suspects detained in the brazen assassination of Kim Jong Nam, an outcast from North Korea’s ruling family who lived abroad in virtual exile for years. The tour was meant to give the trial participants a better understanding of how events unfolded on Feb. 13, when the two women allegedly smeared VX nerve agent onto Kim’s face. Defence lawyers say they were duped into believing they were part of a harmless prank for a TV show, but prosecutors counter that their behaviour showed they knew they were handling poison. High Court Judge Azmi Ariffin visited the check-in kiosk in the budget terminal where the two women approached Kim. The judge then followed the path Kim walked to seek help at the airport clinic and retraced the movement of the two women. Huong appeared unwell midway through the three-hour site visit, while Siti Aisyah broke down in tears. Both women were then provided wheelchairs. Defence lawyers later said both women were exhausted from wearing heavy bulletproof vests throughout the visit. Airport closed-circuit television recordings from Feb. 13 show Huong approaching Kim and grasping his face from behind near the airport’s check-in counters before quickly leaving. Siti Aisyah could not be seen but was identified by a police witness as a figure running in another direction. The videos also show the women heading to separate bathrooms to wash their hands. Since the trial opened on Oct. 2, witnesses have testified that Kim died from acute VX poisoning and that the banned chemical agent was found on his face and clothing, as well as on the women’s clothing and on Huong’s fingernail clippings.